The best wood floor finish for your lifestyle will reduce or even eliminate the ongoing costs of maintenance or repair or replacement. There are a hundred ways to wreck a wood floor. The daily grind is the most popular. One way to shorten that list to 99 is to choose the best wood floor finish for your lifestyle that is either wear-able or repair-able. 275 VOC grams per liter or less is the government's mandated number, but it's not the first. Every few years Uncle Sam dials it down and then a mad scramble to comply ensues. Paint and finish manufacturers who do nothing until the government forces them then rush a new product to market with relatively little field testing. Consumers and flooring pros are sent as lab rats into the real world to live and learn, which can take a decade, or so. Avoid product failure and future unavailability by finding low VOC coatings with a history. Keep in mind this recommended coverage is for top coatings over strip flooring, as opposed to squares or parquet. By comparison, 350 to 500 square feet per gallon is reasonable for primers and sealers, since these products are being absorbed into raw wood rather than building up on top. Wood flooring is dynamic; it wants to breathe from side to side seasonally. A thick static blanket of floor finish does not, resulting in panelization damage-- a repeating crack every six or eight boards apart. 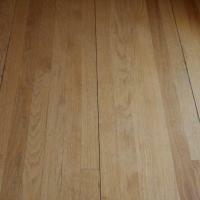 The best wood floor finishes are thinner and supple enough to allow that movement. So look for less-is-more type floor coatings that are still tough but go farther per gallon and avoid the damage. So how do you measure tough? The Taber abrasion wheel--a turntable that spins a coated specimen 4" in diameter. Sand paper goes where the needle would be if this was a phonograph, and then the counting begins. How many turns it takes to remove x amount of finish from the specimen's surface is the Taber rating. So, the higher the number, the more scuff-resistant the finish. Scuff resistance protects your wood floor from the daily grind--your wood floor's public enemy number one. It's what causes those gray traffic patterns to appear. If you are not a flooring pro, look for a single component with a Taber rating of 2300 or so. Then find someone experienced with a catalyzed or cross-linked product that tests out at 4300 turns or better. In either case, these will be waterborne wood floor finishes. How long before another coat is necessary? It's like tires on your car--how you drive determines how long they last. The best wood floor finish for a busy growing family that pretty much lives on their kitchen wood floor just might be the one with the highest Taber rating they can afford.